This guy, the one on the left, somehow survived Hurricane Maria in Puerto Rico. Animal Lighthouse Rescue found him there, on the street, and brought him to New York. 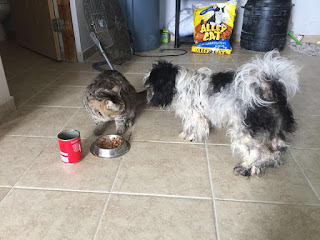 There are a whole lot of strays in Puerto Rico these days, They call them satos and it's estimated there are over 250,000 of them. Many of their stories don't end well. I'm very happy to be part of one that's going a little better, that of this guy here. ALR had named him Mario, but my wife didn't love that name. Before picking him up, I had only this photo. I sat and brainstormed after work with two girls who happened to be sitting in my department office. One wanted to call him Oreo. I can see how that fits, but I didn't think it was appropriate to name a dog after a cookie. that's what he's called now. He was only Mario for a few weeks, so I think he's unlikely to have an identity crisis any time soon. You can see he looks just a little different than he did when they found him. Sometimes a bath and a makeover can work wonders. I'm really grateful for the rescue organizations around. At first, I was frustrated going through all sorts of applications and things, but once something works, it works. We had another dog, but he moved out with my daughter back in June. (Fortunately, we have visitation rights.) When we got him, a friend of mine (who I later learned actually runs a rescue) screamed at me for not going to a rescue. I hadn't even thought about it. My daughter had been bothering us for a dog for years. I could've gone either way. But when my wife said yes, my daughter began haunting pet stores until she found one. I gave them money, and they gave us the dog. It was as simple as that. It was pretty tough for me to find a good pet. My daughter, who visits regularly, is allergic to many animals but tolerates dogs who don't shed. My wife is not allergic but very much appreciates dogs who don't shed. If you're curious, some breeds that don't shed are Maltese, Yorkie, Shih Tzu, Schnauzer, Havanese, and Poodle, or mixes of above. We know Toby is Shih Tzu and we think he might be mixed with Poodle. 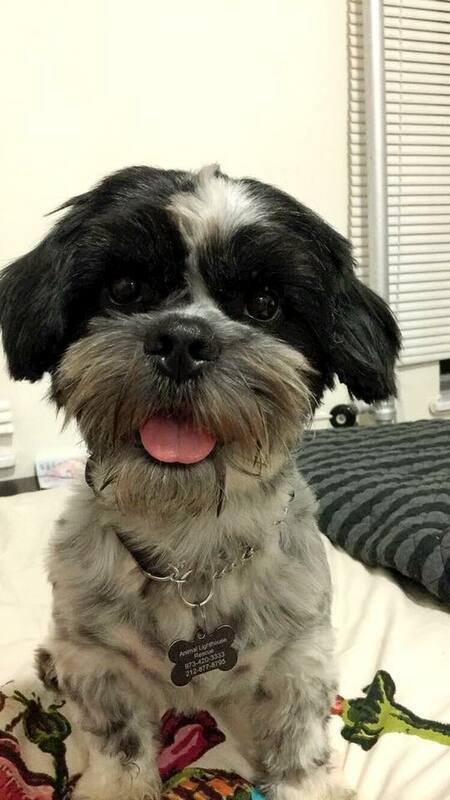 Although he looks like a Shih Tzu, he kind of acts like a Poodle. 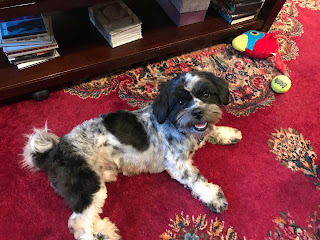 It's possible, of course, that he's a Shih Tzu who thinks he's a Poodle. In my experience, Shih Tzus are more passive and Poodles are more active. Of course, I have very little experience and could be completely off base. In any case, I hope he isn't fooling himself, They tell me the cost of doggie psychiatrists is prohibitive, and my insurance surely doesn't cover it. Toby is bilingual, of course. I knew this because he ignored commands not only in English, but also in Spanish. By now I've gotten him to do a pretty passable "sit," and I'm working on "stay." As a professional teacher, this is a point of pride with me. Naturally I've put him in school, and I have to admit that he's the first person in my family to attend private school. Beginning January 13th he'll be attending weekly classes at Petco in Baldwin. The trainer tells me there's another Puerto Rican dog in the group, so I'm happy Toby will finally be able to chill with one of his paisanos. I don't know what image floats through your mind when you hear the phrase, "boys with toys," but the one I see is just to the right. I'm really proud to have played some small part in helping this little guy. It's a win-win, because his happiness is mine too. On another note, our winter break has come to a close. I'm sorry you have to go back to work today. I assure you that I do too. There are those times when a person has to make the supreme sacrifice and go to work. Remember that you're there for the kids, and not for the crazy administrators demanding pointless redundant paperwork for no reason. I'm usually happy when I focus on the kids. And by the way, if you're suffering from empty next syndrome, or if you need a kid to focus on when you're at home, consider adopting one. Works for me, at least. I wish all readers of this blog a very happy and healthy 2018. Please stop saying this nation has gone to the dogs, because that's an insult to dogs. If dogs ran the country, we'd almost certainly be better off. They're smarter than you think.